Thanks, Rabbie, for the link to the photos, the one posted on the EVA site is directly from the spot of my current residence and I have been looking for a photo like that for ages. Did not think of searching for Blackfriars though. Weirdly, I can't place any of the photos that are listed as Blackfriars Road, though. One of them is supposed to be numbers 394, but the numbers don't even run that high I think. Not even the old reproduced Ordnance Survey maps from 1872 and 1914 have any of the addresses that the EVA site has for Blackfriars Road. Maybe the road ran once beyond St. George's Circus? Or the archive has those pictures wrong. I wonder why the Blackfriars Settlement building were the only ones to survive demolition in the 50s? I have seen a photo from 1957 with one of the modern blocks completed, but one of the terraces still surviving. So not all of the square was destroyed in the war either. I think the bricks from the old terraces are still under the lawn of the blocks, as some could clearly be seen when some of the lawn was dug up for some works recently. Btw, Margaret, there has been a few other threads about the Square here, should come up on a search. Also the one of the Palestra-threads had something about the square. I am intrigued by that key you mention, shame the original buldings are no longer there to find the correct lock for it! We have a rose garden and a large selection of play facilitys including a all weather 5aside football pitch & a half court basket ball court as well as swings and a adventure style playground. im supposed to be going to the community meeting tonight but doubt i will make it as work is looking like it may keep me in late, plus i have a evil cold! Edited 1 times. Last edit at 24 January 2006 4.56pm by mojonojo. From your description of the all the playgrounds it sounds at though it is a rather large square - must be two acres perhaps? I have just found it also on Greenwood's Map of 1827 so it is certainly very historic - possibly built when he swamp known as "The Prince's Meadow" was reclaimed in 1815 - 16? If only my key or those imposing walls could talk we would hear the answers. Reverend Booth's Poverty Map of 1898 shows Nelson Square as a wealthy middle-class area at that time, the second highest on his economic scale. It must have been a most painful come-down for my pioneering forebears when they were reduced to living in a tiny cottage in the Australian bush. They were hard times indeed. Sorry to her about the evil cold. Hope you are well soon and out in the garden again. Now I'm confused - Booth's map is confusing because the fronts of the houses are red but the body of them is coloured pink. I suspect this is evidence of social decline in progress - backed up by the reference in the diary to some houses now being let as tenements (i.e. rented out as flats). A house in the square The square would have been a respectable enough address for the ladies of the Mission to work out of, but cheap enough for the charity to afford to buy. A quick play with Google Earth and Photoshop . . . the three surviving Georgian houses are bottom row, on the right; Blackfriars Road runs North-South on the left, Union Street East-West across the top (just for those trying to orientate themselves). Edited 1 times. Last edit at 25 January 2006 11.24am by markandjoan. Thandkyou for that - it is fantastic. My son brought up Google Earth on my computer up for me but I don't know how to work it - and probably would not have thought of consulting it anyway. That is truly a wonderful aerial view of what is there today. It must still be a nice place to live. 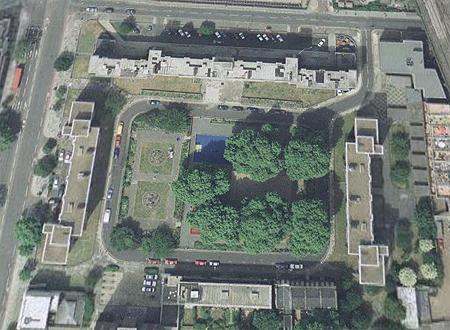 Yes, I am sure you are right about Booth's map and the declining fortunes of Nelson Square. My forbears (Fred and Jessy Sherwood) had fallen on hard times even in 1842 and with five children and three servants to support , emigration must have seemed like a solution to their problems. As you said earlier, those houses were built for a wealthy clientele that preferred to buy elsewhere and I suspect that Fred and Jessy were able to get theirs relatively cheaply when they married in 1840. Fred was a successful builder and bricklayer who inherited the family company in 1831 - office in 20 Cornwall Rd and later in Commercial Rd - but by 1840 the depression had bitten him badly. However, with hard work and a willingness to diversify, they picked up a little in Oz - which is just as well because they ended up with 8 children! As of this week you can now access the same level of detail with Google Local's web-based satellite images, so you don't necessarily need to tangle with Google Earth. You can't tilt the image like markandjoan did above, but still useful for quickly looking up a location. Thanks for that link - I will have hours of fun with it - looking up all the other family places that still exist. What wonderful people you have as subscribers - I love them all.